Red Sparrow is an Upcoming Hollywood Film in 2018, It is Thriller Film and Jennifer Lawrence, Joel Edgerton in lead roles. This film is Directed by Francis Lawrence and Produced by Peter Chernin, Steve Zaillian, Jenno Topping. It is made under the banner of Chernin Entertainment. Red Sparrow is scheduled to release on 2nd March 2018. 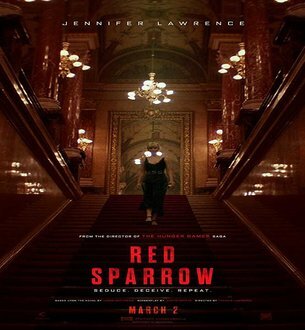 The film Red Sparrow based on the book penned by Jason Matthews. The screenplay was adapted by Justin Haythe who is also the man behind A Cure for the Wellness and Lone Ranger. The movie also starring Charlotte Rampling, Matthias Schoenaerts, Jeremy Irons & Mary Louise Parker is set to release on the big screens in 2nd March 2018. The film looks action packed and has great amount of drama too. Jennifer Lawrence as a Russian dangerous agent (Seductress) can make you weak in your knees.